Welcome to the Product Offerings page for Bella Vita Creative! When it comes to preserving memories, Bella Vita Creative has you covered. One of the most exciting things you can do with your photos is have them printed . . . like in the old days! Once your images are ready, you can send prints to grandma, redecorate your living room, or have me put together an album so you can put your feet up, sip your tea, take a moment to breathe in deeply, turn the album pages with your beautiful photos, and remember exactly why you love your blessed life so much. Check it out: below are just a few ways to keep your memories--in an album, reception book, save-the-date card, calendar, poster, gallery wrap, canvas print . . . the possibilities are endless! Let me tell you, when you see these products in person, they are NOT to be ignored! I have personally witnessed guests and friends "oohing" and "aahing" over these beautiful products. For more information about sizes and pricing. just give me a call or email me through my contact page! 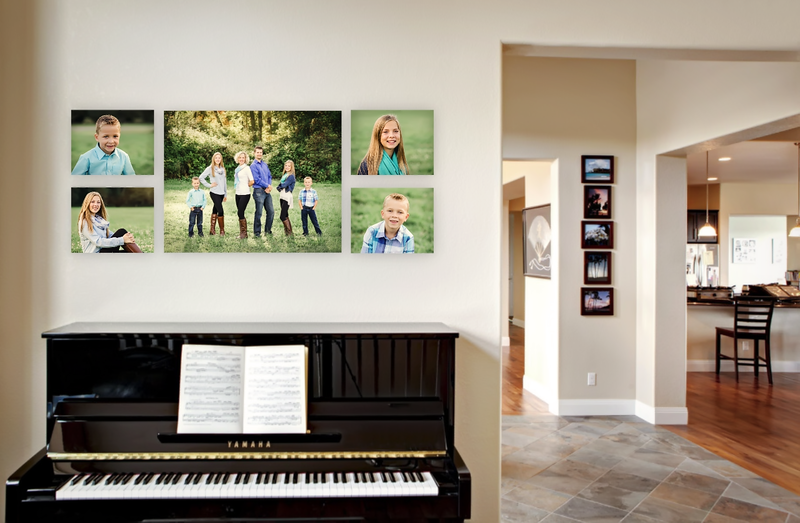 Fine Art Canvas Wrap Clusters, created using your own wall photo. We can design any combination of sizes to fit the design of the wall space in your home.